Get ready to take your dishes to yet another level with some delicious sauces! Sauces are one of the biggest players in maximizing flavor in your food. Not only do they take your meals up another notch, sauces can be used before cooking as marinades for meats and veggies, and they are a perfect way to finish a dish. Take for example, spaghetti, burgers, and salads. Spaghetti would just be a boring, bland mess of noodles without a zesty marinara sauce coating every strand. Burgers, no matter how juicy and meaty, need that extra pow! to make it really stand out, whether it’s with mayo, ketchup, or pesto. And a salad without a vinaigrette is just a bowl of raw vegetables. Add texture. Sauces can be chunky or smooth, oil-based, or a thin liquid. One of the most pleasing aspects of eating a delicious meal are the varying textures of the dish. If your dinner consists of creamy mashed potatoes or pan-seared chicken breast, a thin gravy is perfect for tying both components together and making the chicken juicier. Add complementary flavors to a dish and balance flavors from all the components. A crisp salad with sweet cherry tomatoes and creamy mozzarella would stand out with a tangy and sweet balsamic vinaigrette. The tanginess balances the sweetness of the tomatoes, but also cuts the fat in the cheese. Meanwhile, the sweetness of the vinaigrette brings out the flavor of the tomatoes. Add juiciness. This works especially well with a dry-cooking method, such as grilling and sauteing. Those BBQ ribs would not be the same if they weren’t slathered in BBQ sauce! Add visual appeal. It’s known that we all “eat with our eyes first,” and it’s true. Pork chops paired with roasted potatoes doesn’t look that appetizing, but add a vibrant chimichurri sauce made of fresh herbs, and it becomes something you want to dig right into! Some sauces also add that very pretty shine, making the dish look lustrous and appetizing. We’ve come up with 5 of our favorite sauces that will cover any range of meals that you will be making in your kitchen. These sauces don’t take all day to make, and most just use ingredients you already have in your pantry. Whether grilled or baked, Mexican or Vietnamese, meat or veggies, these recipes act as guidelines and can be switched up for varying tastes. This recipe was a total winner with our Kitchen Heroes. Its spicy, sweet, and tangy flavors are perfect served over chicken kebabs, drizzled in turkey meatball lettuce cups, as a salad dressing, and alongside burgers. Nuoc Nam is a Vietnamese staple, and although it has a strong, fishy smell, you will love dipping veggies and summer rolls in this, as well as flavoring up your meats and tofu with this as a marinade. Pestos are great on almost anything, and this one gets a nice, smoky flavor from broiled sweet red peppers and eggplant. We like to make a huge batch and freeze for future meals. Chimichurri is a quick and refreshing way to add flavor to meats and veggies. It’s also a good way to use up the extra cilantro and parsley you have in your fridge! We think a classic marinara sauce is something you must have on hand. We’ve used it as a pasta sauce, to eat with calzones, as a base for a creamy tomato soup, and added spices to make enchilada sauce. Some sauces may require refrigeration for an hour or overnight, so that the flavors can meld together for a better taste. A smooth sauce would require a blender or food processor, whereas a chunky sauce only needs a knife and cutting board. Make things easier by using the equipment that is needed. 3. Taste as you go! Everyone’s taste preferences are very different, so just because a recipe calls for a certain amount of salt, it doesn’t mean that it is the right amount for you. Adjust accordingly. You can always add more, but you can’t take away, so season little by little as you go. Also keep in mind that the flavors of fresh ingredients change with the season. Tomatoes can be sweet one time, and sour the next. Finally, taste on more time before you finish the dish to make sure it is exactly to your liking! 4. Choose good quality ingredients. This will really ensure that your sauce tastes the best! 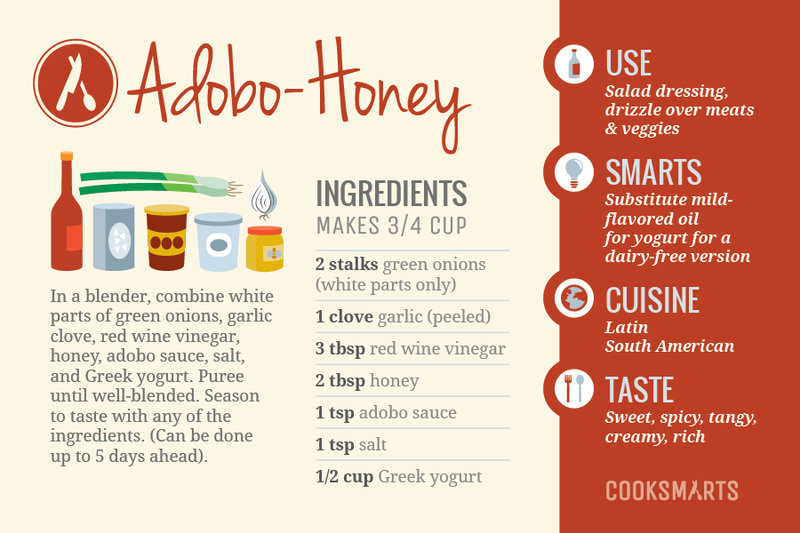 Transform any bland and boring dish into a flavorful meal with these 5 delicious sauces. Transform a bland dish to a flavorful meal with 5 delicious sauces.